UPDATE: Paris Schutz reports live from March to the Polls 2018. Women’s March Chicago is throwing another event Saturday. Called March to the Polls 2018, it will honor first-time voters. “The purpose is to start the midterm elections in Illinois the best way we possibly can, by celebrating first-time voters and making sure they’re all eligible to get registered and cast a ballot in the upcoming election cycle,” said Rudy Garrett, a board member with Women’s March Chicago and the co-deputy director of Chicago Votes. To help with that effort, the march will feature a Voter Village, opening at 9 a.m. at the intersection of Congress Parkway and Columbus Drive. It will have more than 50 booths from “progressive organizations, political candidates, businesses” to help answer any questions from first-time voters, according to the event’s press release. Saturday’s event will also include a rally with Chicago-area activists and artists. A map of Saturday’s March to the Polls. Click to enlarge. Starting at 12:30 p.m., participants will march along Jackson Street to Federal Plaza. First-time voters and others who wish to cast their ballots can proceed on to two early voting sites: Cook County Early Voting Site at 69 W. Washington St., and City of Chicago Early Voting Site at 174 W. Washington St.
Garrett said she sees the event as part of a long-lasting effort to include more women in political office, and to increase voter turnout. 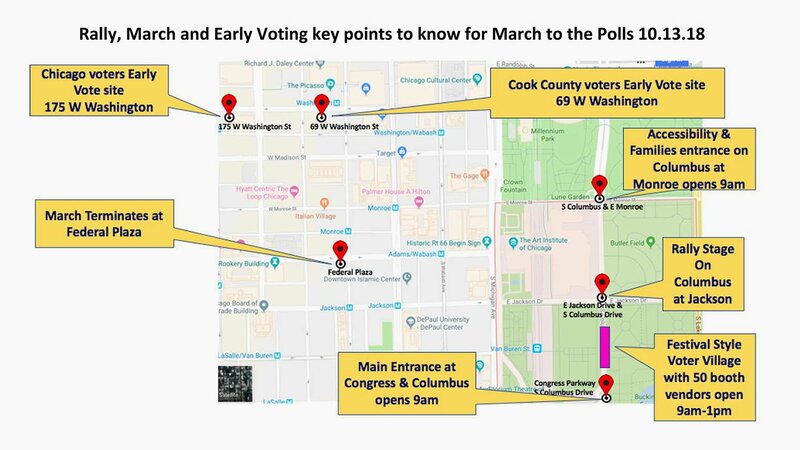 Where: Participants can enter Grant Park at the intersection of Congress Parkway and Columbus Drive to access the Voter Village, starting at 9 a.m. The rally begins at 10 a.m. The march starts at 12:30 p.m., heading down Jackson Street and ending at Federal Plaza. Participants may then proceed to two early voting sites, open until 5 p.m.
Who: Those who identify as women and their loved ones. Women’s March Chicago is hosting the event, and Chicago Votes is co-hosting the First Time Voter Experience: Parade to the Polls.